DOLAN, FLORA O. (SARNO) of Readville formerly of Jamaica Plain. Devoted wife of the late Edward Dolan. Loving mother of Edward & his wife Elaine of Halifax, Steven & his wife Carol of West Roxbury, Kathleen Ginnetty & her husband Gerard of Hyde Park, Jane & her late husband Michael Corey of Readville and Janice Dolan & her partner Stephan Rodgerson of Readville. Sister of the late Alfonso, Michael, Arthur, Joseph & Edward Sarno, Catherine (Concetta), Viola & Gloria. Grandmother of Christopher Dolan & fiancé Colleen, Kimberly & husband Kenneth Bartell, Nicholas & Sally Dolan and Eric & Ryan Ginnetty, Great Grandmother of Avirey, Samuel, Colton & Norah Bartell. Flora worked as a welder at the Oakland California Naval Base during World War ll. She then transferred to the Boston Naval Yard, Fargo Building where she worked until she left to raise her family. 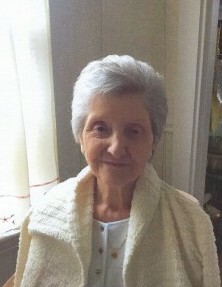 Flora enjoyed spending time with her family, reading and Sunday morning trips to the casino. In honor of her memory please perform a random act of kindness, take a risk, try your luck and have some fun. Funeral from the Mann & Rodgers Funeral Home, 44 Perkins St, JAMAICA PLAIN on THURSDAY at 10:30am followed by a Funeral Mass at St Theresa of Avila Church in West Roxbury at 11 o’clock. Visiting Hours are Wednesday from 4-8pm. Relatives and friends invited. Interment St Michael’s Cemetery.